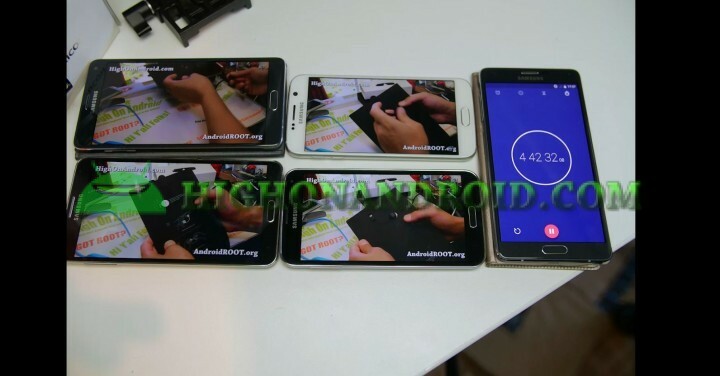 In this test, all of these phones are running the latest TouchWiz Android Lollipop stock firmwares. Very interesting indeed. The Galaxy S6 finished at 5 hours and 20 minutes while the Galaxy Note 4/Note 3 both finished up at 6 hours and 10 minutes. Surprisingly, the Galaxy S5 came on top with a whopping 6 hours and 50 minutes. Well, unless you actually test them in controlled environment, you never know the actual performance/battery life on these bad boys. We should have more test results soon but in the meanwhile, try these tests on your phones and do let us know what kind of HighOnAndroid SOT you get! Check out our new HighOnAndroid SOT Test page for results on all the Android devices we have tested so far. Next story Galaxy Note 4 vs. Nexus 6 vs. OnePlus One SOT(Screen-On-Time) Battery Test! Previous story Galaxy S6 vs. HTC One M9 SOT(SCREEN-ON-TIME) Battery Test!